Chronic Ankle Instability (CAI) is one of the residual problems after an ankle sprain injury, specifically Lateral Ankle Sprain (LAS). CAI is defined as the continuation of the post-injury symptoms such as swelling, impaired strength, instability (occasional giving way), and impaired balance responses for more than 6 months following the initial injury. CAI has many consequences on the ankle structure and function including increased ligamentous laxity, proprioceptive deficits, and activity limitations that affect the execution of activities such as walking or jumping and occupational and sport restriction. These associated problems could persist for decades. Up to 72% of people are unable to return to their original level of function and 85% of people who are diagnosed with CAI develop problems in the contralateral ankle following unilateral ankle sprain. There are two, widely accepted, subgroups of CAI used in the literature; Functional Instability (FI) and Mechanical Instability (MI). Individuals with functional instability are presented with recurrent ankle sprains and a frequent sensation of instability (giving way). In examination, the ankle would exhibit normal motion and negative ligaments laxity. In other words, it will be the person with self-reported symptoms such as weakness and pain with feelings that the injured ankle is less functional than the other. The continuous feeling of instability could be attributed to multiple factors such as muscle weakness, muscle recruitment patterns, decreased ankle range of motion, balance deficits, and impaired sensorimotor performance and joint proprioception. Mechanical instability is defined as pathologic ligamentous laxity around the ankle-joint complex. MI is characterized by the presence of ligamentous laxity which occurs in 30% of patients following the initial ankle sprain. Most patients present with a mixture of mechanical and functional instabilities. There is a wide debate in the literature to differentiate both types based on symptoms and physical examination findings. Postural stability impairments were found in a group diagnosed with FI whether or not MI was present. Another study investigated the peroneal reaction times after inversion perturbation and reported longer duration in individuals with FI only. Meeuwiss et al described an MSK injury as a focal point that when it occurs a series of subsequent events will be triggered. This focal point is influenced by an interaction of intrinsic and extrinsic risk factors. Intrinsic factors such as advanced age, poor neuromuscular control, previous history of trauma, etc. may interact with extrinsic factors in a sports event or a simple daily activity to predispose a person or an athlete to injury. The presence of enough neuromuscular control, flexibility and strength will protect this person from sustaining an injury. On the other hand, if these factors are not present, the person may be more likely to be injured. If this occurs, the interaction of intrinsic and extrinsic factors again will determine the probability of recovery or re-injury. Understanding this process has great reflections on identifying risk factors and designing rehabilitation programs. The mechanism of developing CAI following acute ankle sprain has been investigated to identify risk factors and their role in predicting recovery. A recent series of investigations were conducted by Doherty et al to measure specific impairments and functional limitations at two weeks, six months and one year following first time LAS injury. Their analysis presented a number of sensorimotor deficits that could be tested by clinicians to predict the development of CAI. However, the question of whether these deficits were originally present or developed as a consequence of the injury is still not answered. Damage to the ligamentous structure due to injury has more than anatomical restrictions. It is rather a wide spectrum of symptoms and limitations. It is theorized that structural deficits such as alterations of ligamentous tensile strength cause disruption in afferent-efferent communication leading to central control issues that manifest itself peripherally. The study of Doherty et al recruited participants at the acute stage following a first time LAS injury and conducted a series of tests to analyze kinematics and kinetics of LL using a motion capture system. Single Limb Standing test was utilized to assess static postural control. For, dynamic postural control, the Star Excursion Balance Test (SEBT) was used to evaluate LL kinematics and kinetics, maximum hip-knee-ankle flexion extension moments and reach distances in the three directions (anterior, posteriolateral and posteriomedial). In addition, participants completed landing and drop vertical tasks, gait analysis tasks and a couple of self-reported measures (The Cumberland Ankle Instability Tool and the Foot and Ankle Ability Measure). These tests were then repeated six months later and one year after the participants were stratified into two groups: CAI group and ankle sprain copers as classified by the Cumberland Ankle Instability Tool. Dynamic Postural Control Deficits: Participants demonstrated reduced hip-knee flexion moment and ankle dorsiflexion in all directions of the SEBT, but the reach distances were reduced in the posterolateral and posteromedial directions only. Interestingly, the deficits presented in the SEBT were noted bilaterally which highlight the hypothesis that LAS is not exclusive to peripheral symptoms but rather have central manifestations as well. These symptoms were present at two weeks, 6 months and one year following the injury. Gait Deficits: Individuals exhibited a reduction of push off tendencies manifested as decreased hip extension and increased ankle displacement in the frontal plane during the gait analysis task. Deficits in Jumping and Landing Tasks: During landing and jumping tests the following were reported: bilateral increases in hip flexion before initial contact (preparation for landing), reduction in hip flexor moment after initial contact, hip stiffness and bilateral increased extension moments during landing, and inter-limb asymmetries. The increased asymmetry reflects the tendency to off-load the injured limb and shift the load to the non-injured side, this may explain the high susceptibility of contralateral injury. These deficits were evident at both acute and subacute phases and were then reported in those diagnosed with CAI. This refer to the hypothesis that these deficits are contributing to the development of Chronic Ankle Instability. However, it is still unknown whether these deficits are the reason behind the injury in the first place or they have developed as a result of the injury. Future studies needed to identify LAS risk factors with a follow-up design that allow us to relate these risk factors to the development of CAI or the contribution to recovery. 1- Inability to complete jumping and landing tasks within 2 weeks following the injury. These tasks successfully predicted the development of CAI by 67.6%. The reported sensitivity and specificity of these tests were 83. 3 and 55.3 % respectively. 2- Poorer dynamic control on the SEBT (hip and knee flexion in the posterolateral and posteromedial directions) at 6 months following LAS injury was able to predict CAI by 84.8% with higher sensitivity and specificity (75 and 91 % respectively). 3- Poorer self-reported function on the Foot and Ankle Ability Measure. The mechanism of ankle sprain injury results in disruption of the ligamentous integrity of the structures preventing excessive inversion and supination (the lateral joint capsule of the ankle and the ligaments supporting the lateral talocrural, subtalar, and distal and proximal tibiofibular joints). Either hypomobility or hypermobility of one or more of these joints will consequently develop. Hypermobility, ligamentous laxity or mechanical instability is characterized by increased joint play motion resulting in abnormal movement patterns on the instantaneous axis of rotation (IAR) of the joint with physiologic movement. The underlying reason for the increased laxity after ligament sprain or tear is that the healing process wasn't optimal enough to restore the original tension leading to altered proprioceptive input from tissues that are abnormally stressed and forces the needs for compensatory motor patterns. The observed over pronation or unstable mortise are the results of ligamentous damage. Two ligamentous structures were described as the cruciates of the subtalar joint; the cervical and interosseous ligaments. These two ligaments are believed to be damaged in ankle sprain and the residual laxity following the injury suggests damage of these structures. Since their function is to limit end-range pronation and supination, early loading of injured cervical and interosseous ligaments may compromise the healing process and cause the ligaments to heal in a lengthened position. Therefore, many clinicians recommend constraining pronation by an orthotic device after ankle injury to allow repair at a more optimal length. Hypomobility, on the other hand, can lead to joint instability through altering the kinetic chain of the lower extremity following LAS. Either physiologic or accessory, hypomobility causes changes in movement patterns leading to abnormal stresses and disrupted proprioceptive input. It is possible to observe hypomobility at the subtalar joint, talocrural joint, distal tibiofibular joint or proximal tibiofibular joint. Limited dorsiflexion is common following LAS, many rehabilitation approaches combine mobilization with movement and ROM exercises to restore ankle dorsiflexion. It may be attributed to gastrocnemius-soleus tightness and/or capsular adhesion. However, accessory motion might be limited but physiological movement is restored via compensatory mechanisms from adjacent structures, for example a vertical limp during gait can be obtained to maintain forward movement of the lower limb when DF is limited at the talocrural joint. Subluxation or mal-position of the talus may also be a reason for hypomobility which is defined by Meadows as ‘‘a biomechanical problem with the joint jamming at one end of the range of movement and blocking movement away from that range." It occurs as a result of the excessive inversion resulting in anterior displacement of the talus. If remained in this position, the torn anterior talofibular ligament heals in an elongated position and loses the mechanical integrity that restrains the anterior displacement of the talus. Limited posterior glide is the end product (limited dorsiflexion). Both hypo and hypermobility should be evaluated and assessed in patients following LAS and those prone to develop CAI and strategies to address both conditions should be integrated in the rehabilitation. The state of function doesn't necessarily reflect optimal healing at the ankle joint complex following LAS. Therefore, treatment shouldn't be accelerated by the rehab team. Monitoring the load on the affected structures and watching signs of inflammation, helps in preventing overload and abnormal tissue stress. To prevent consequent CAI, joint stability strategies should be adopted in rehab as well as normalized joint mechanics followed by gradual increase of load. A rehabilitation program designed to tackle the effects of injury on the ankle joint complex may offer promising results in regards with preventing CAI. ↑ Hiller CE, Kilbreath SL, Refshauge KM. Chronic ankle instability: evolution of the model. Journal of athletic training. 2011 Mar;46(2):133-41. ↑ Löfvenberg R, Kärrholm J, Lund B. The outcome of nonoperated patients with chronic lateral instability of the ankle: a 20-year follow-up study. Foot & ankle international. 1994 Apr;15(4):165-9. ↑ Konradsen L, Bech L, Ehrenbjerg M, Nickelsen T. Seven years follow‐up after ankle inversion trauma. Scandinavian journal of medicine & science in sports. 2002 Jun;12(3):129-35. ↑ Konradsen L, Ravn JB. Prolonged peroneal reaction time in ankle instability. International journal of sports medicine. 1991 Jun;12(03):290-2. ↑ Rosenbaum D, Becker HP, Gerngroß H, Claes L. Peroneal reaction times for diagnosis of functional ankle instability. Foot and ankle surgery. 2000 Mar;6(1):31-8. 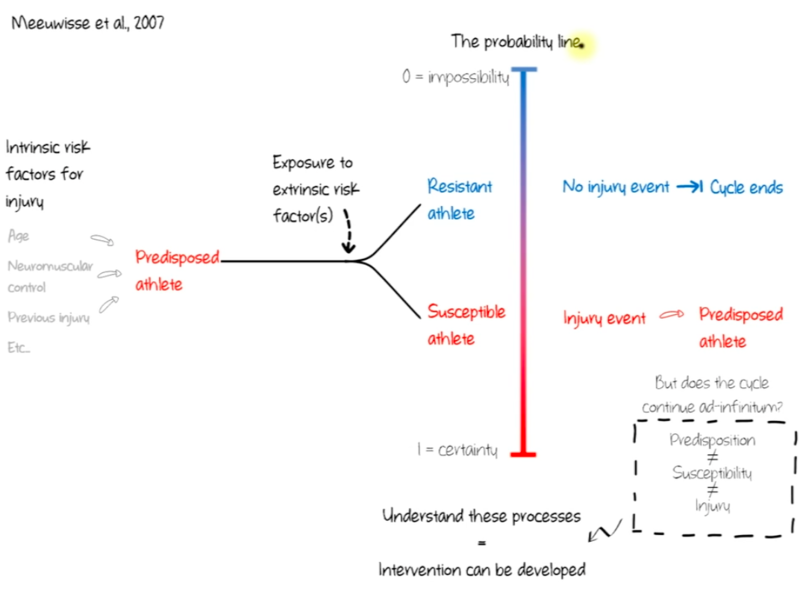 ↑ Meeuwisse WH, Tyreman H, Hagel B, Emery C. A dynamic model of etiology in sport injury: the recursive nature of risk and causation. Clinical Journal of Sport Medicine. 2007 May 1;17(3):215-9. ↑ Doherty C, Bleakley C, Hertel J, Caulfield B, Ryan J, Sweeney K, Patterson MR, Delahunt E. Lower limb interjoint postural coordination one year after first-time ankle sprain. Med Sci Sports Exerc. 2015 Mar 31;47(11):2398-405. ↑ Doherty C, Bleakley C, Hertel J, Caulfield B, Ryan J, Sweeney K, Delahunt E. Inter-joint coordination strategies during unilateral stance 6-months following first-time lateral ankle sprain. Clinical Biomechanics. 2015 Feb 1;30(2):129-35. ↑ 10.0 10.1 Doherty C, Bleakley C, Hertel J, Caulfield B, Ryan J, Sweeney K, Delahunt E. Inter-joint coordination strategies during unilateral stance 6-months following first-time lateral ankle sprain. Clinical Biomechanics. 2015 Feb 1;30(2):129-35. ↑ Doherty C, Bleakley CM, Hertel J, Caulfield B, Ryan J, Delahunt E. Laboratory measures of postural control during the star excursion balance test after acute first-time lateral ankle sprain. Journal of athletic training. 2015 Jun;50(6):651-64. ↑ Doherty C, Bleakley C, Hertel J, Caulfield B, Ryan J, Delahunt E. Dynamic balance deficits 6 months following first-time acute lateral ankle sprain: a laboratory analysis. journal of orthopaedic & sports physical therapy. 2015 Aug;45(8):626-33. ↑ Doherty C, Bleakley C, Hertel J, Caulfield B, Ryan J, Delahunt E. Dynamic balance deficits in individuals with chronic ankle instability compared to ankle sprain copers 1 year after a first-time lateral ankle sprain injury. Knee Surgery, Sports Traumatology, Arthroscopy. 2016 Apr 1;24(4):1086-95. ↑ Doherty C, Bleakley C, Hertel J, Caulfield B, Ryan J, Delahunt E. Lower extremity function during gait in participants with first time acute lateral ankle sprain compared to controls. Journal of Electromyography and Kinesiology. 2015 Feb 1;25(1):182-92. ↑ Doherty C, Bleakley CJ, Herte J, Caulfield B, Ryan J, Delahunt E. Gait biomechanics in participants, six months after first-time lateral ankle sprain. ↑ Doherty C, Bleakley C, Hertel J, Caulfield B, Ryan J, Delahunt E. Locomotive biomechanics in persons with chronic ankle instability and lateral ankle sprain copers. Journal of science and medicine in sport. 2016 Jul 1;19(7):524-30. ↑ Doherty C, Bleakley C, Hertel J, Sweeney K, Caulfield B, Ryan J, Delahunt E. Lower extremity coordination and symmetry patterns during a drop vertical jump task following acute ankle sprain. Human movement science. 2014 Dec 1;38:34-46. ↑ Doherty C, Bleakley C, Hertel J, Caulfield B, Ryan J, Sweeney K, Patterson MR, Delahunt E. Coordination and symmetry patterns during the drop vertical jump, 6‐months after first‐time lateral ankle sprain. Journal of orthopaedic research. 2015 Oct;33(10):1537-44. ↑ Doherty C, Bleakley C, Hertel J, Caulfield B, Ryan J, Sweeney K, Patterson MR, Delahunt E. Coordination and Symmetry Patterns During the Drop Vertical Jump in People With Chronic Ankle Instability and Lateral Ankle Sprain Copers. Physical therapy. 2016 Aug 1;96(8):1152-61. ↑ Doherty C, Bleakley C, Hertel J, Caulfield B, Ryan J, Delahunt E. Single‐leg drop landing motor control strategies following acute ankle sprain injury. Scandinavian journal of medicine & science in sports. 2015 Aug;25(4):525-33. ↑ Doherty C, Bleakley C, Hertel J, Caulfield B, Ryan J, Delahunt E. Single‐leg drop landing movement strategies 6 months following first‐time acute lateral ankle sprain injury. Scandinavian journal of medicine & science in sports. 2015 Dec;25(6):806-17. ↑ 22.0 22.1 Doherty C, Bleakley C, Hertel J, Caulfield B, Ryan J, Delahunt E. Single-leg drop landing movement strategies in participants with chronic ankle instability compared with lateral ankle sprain ‘copers’. Knee Surgery, Sports Traumatology, Arthroscopy. 2016 Apr 1;24(4):1049-59. ↑ Doherty C, Bleakley C, Hertel J, Caulfield B, Ryan J, Delahunt E. Recovery from a first-time lateral ankle sprain and the predictors of chronic ankle instability: a prospective cohort analysis. The American journal of sports medicine. 2016 Apr;44(4):995-1003. ↑ 24.0 24.1 24.2 Denegar CR, Miller III SJ. Can chronic ankle instability be prevented? Rethinking management of lateral ankle sprains. Journal of athletic training. 2002 Oct;37(4):430. ↑ Viladot A, Lorenzo JC, Salazar J, Rodriguez A. The subtalar joint: embryology and morphology. Foot & ankle. 1984 Sep;5(2):54-66. ↑ Orteza LC, Vogelbach WD, Denegar CR. The effect of molded and unmolded orthotics on balance and pain while jogging following inversion ankle sprain. Journal of Athletic Training. 1992;27(1):80. ↑ Meadows JT, Meadows JT. 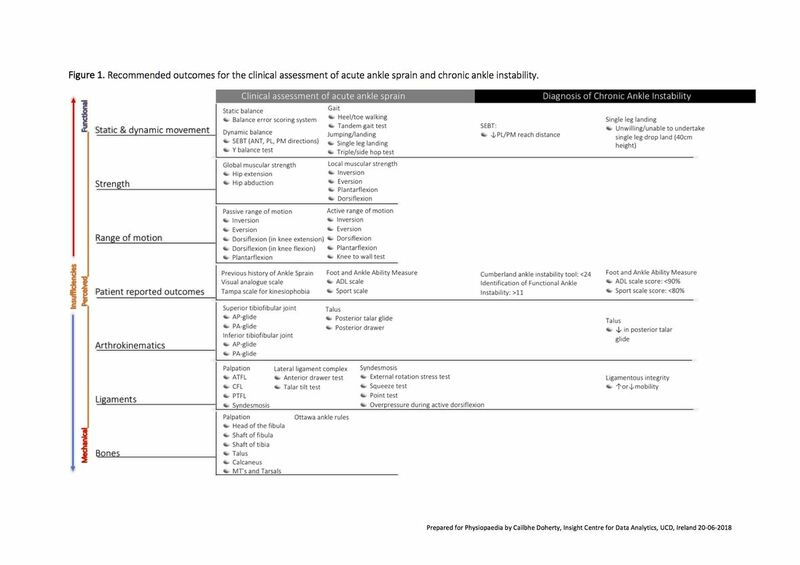 Orthopedic differential diagnosis in physical therapy: a case study approach. New York, NY: McGraw-Hill; 1999.